Automotive Gesture Recognition Market size is estimated to reach USD 13.6 billion by 2024; according to a new research report by Global Market Insights, Inc.
Increasing preference of customers to opt for cars with advanced safety features along with rising gesture-based infotainment systems in vehicles is driving the automotive gesture recognition market share. Increasing electronics and sensors in vehicles for assisting in driving operations and enhancing the overall driving experience is further strengthening the industry growth. Safety regulations designed by various governments is improving the product penetration owing to advantages offered such as compatibility of vehicle’s electronic systems and improved maneuvering control. However, prohibitive cost of complexity, and integration may challenge the automotive gesture recognition market from 2017 to 2024. Manufacturers are engaged in developing the technology resulting in increased cost. The global automotive gesture recognition market participants are continuously investing in R&D to introduce innovative solutions for improving driving experience. For instance, in 2017, Continental AG announced an advanced human machine interface system with multi-finger gestures and haptic feedback technologies along with handwriting capabilities. This enabled the company to significantly increase its market share in the market share. Touch based systems accounted for approximately 2,095.1 thousand units in 2017 and is predicted to continue its dominance over the projected time span owing to higher customer preference. Consistent advancement in the vehicle features and development in the interior are the prime factors fueling the product demand. In addition, capacitive touch pads and touch screen used for infotainment, navigation features and HVAC systems are further fueling the automotive gesture recognition market demand. Hand or fingerprint authentication showcased significant growth rate of more than 44% CAGR over the forecast timeframe. This growth is attributed to its usage for environment controlling applications, vehicle access and other vehicle functions. Automobile manufacturers are installing these systems in their product portfolio to attract consumers and enhance their market share. For instance, in June 2015, BMW introduced 7 series with device capability of recognizing hand gestures using camera and IR light. The 3D camera offering superior functionality is further integrated with the 3D image sensor that facilitates easy recognition of the gestures, further strengthening the automotive gesture recognition market share. PCV dominates the overall market size contributing at around 85% of the overall volume share in 2017. Rising standards of living, increasing middle-class population in emerging nations in conjunction with strong GDP growth is leading to upsurge in sales of high-end and medium passenger car sales. Superior sales of premium and luxury cars installed with advanced electronic systems will boost the automotive gesture recognition market growth. Europe accounted for the maximum revenue share of more than 43% in 2017. This dominance is credited to the continuous innovation in automotive industry along with focus on vehicle driver and passenger safety. Growing adoption of telematics control units in passenger cars to ensure occupants safety will further augment industry growth. Supporting government regulations for bringing rapid assistance to motorists involved in accidents is strengthening the industry growth. For instance, in April 2018, European Commission mandated the automobile OEMs for equipping its new cars with automated emergency services such as e-call technology for improved passenger safety. 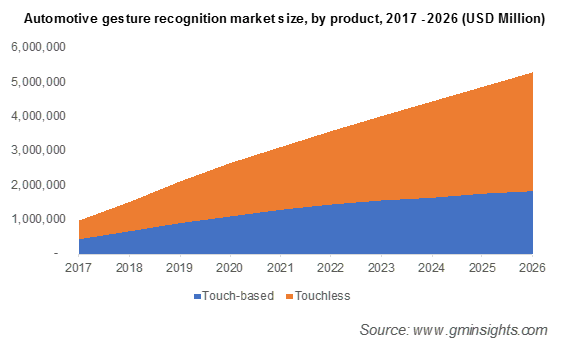 Key automotive gesture recognition market players are Delphi Automotive PLC, Harman International, Melexis, Continental AG, eyeSight Technologies Ltd., and Sony Depthsensing Solutions. Other notable participants include Intel, Synaptics Incorporated, Visteon Corporation and Texas Instruments. Expansion of the product portfolio, increasing regional presence and developing advanced prototypes are among the major strategies adopted by the automotive gesture recognition manufacturers. For instance, in 2018, Microchip Technology Inc. launched an advanced 3D gesture recognition controller based on a low-cost single chip solution for diversified automotive applications including navigating infotainment systems, interior lighting, sunshade operation, and foot-activated rear liftgates.